Do you want to meet local people, exchange ideas and find out how you can make a positive difference, not only to your local community, but to people around the world? 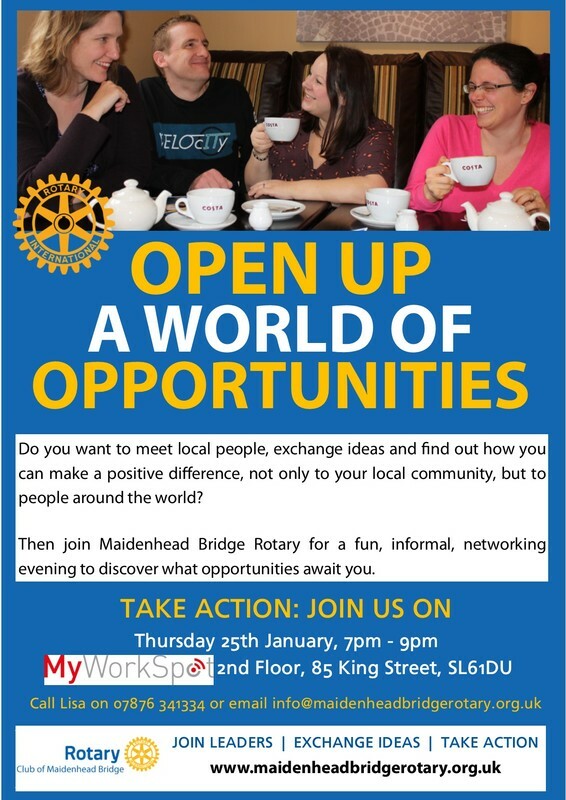 Then Maidenhead Bridge Rotary invites you to join them for a fun, informal, networking evening on Thursday 25th January at MyWorkSpot (2nd Floor, 85 King Street, SL61DU) from 7pm to discover what opportunities await you. Meeting on the first and third Sunday of each month, at 10.30am in Costa Coffee on Maidenhead High Street, the aim of The Rotary Club of Maidenhead Bridge is to provide 30+ young professionals and parents with an opportunity to get involved in the local community, and to meet like-minded people in the local area. “We want to share the great things we’re doing in the community, and let others know how they can get involved,” said Michael Atherton, Club President. The Rotary motto is “Service Above Self” and Maidenhead Bridge Rotary has lived up to it in a bit way. The club is the mastermind behind the Annual Easter Family Fun Day in Grenfell Park, Reindeer Racing in The Nicholson Shopping Centre and the annual Health Awareness Day in the town centre. They also marshal at the Maidenhead Half Marathon, regularly volunteer at the local food bank FoodShare, run charity fundraisers and are generally out and about making our community a better place. In addition to the numerous community activities there are of course social ones, enabling members to get to know each other better and to have fun being involved in the local community. The vibrant club is always on the lookout for new members and project partners, so if any of the above sounds good to you come along to the fun social and community networking event, who knows what exciting adventures it might take you on! A special thank you to MyWorkSpot, a workplace and coworking community built for independent workers, entrepreneurs, growing businesses and corporate communiters, for hosting this event.